Having seen the first film at least 50 times (that is not an exaggeration), due to a douchebag of an ex and his frat brothers obsession with this movie, it was one of the few great things I took away from that relationship. Unfortunately, John Cusack will not be reprising his role as Adam, whose girlfriend just dumped him. 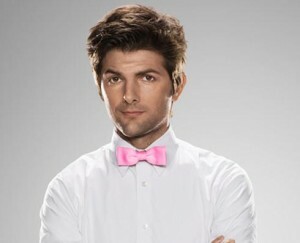 I am actually happy that Cusack will not be returning and am very excited that Adam Scott will most likely join the cast as an entirely new leading man. Final talks are underway as we speak for Scott. Director Steve Pink is also back on board as director. It’s 2013, we need a fresh new face and I believe Adam is just the guy they need. I’m also a huge fan of Clark Duke. I first fell in love with this fresh face on the ABC Family TV Series ‘Greek‘ which had a five year run from 2007 to 2011. Craig Robinson and Rob Corddry are also expected to return. Happy Time Travelling and bring your hot tub gear!!! This entry was posted on Wednesday, May 8th, 2013 at 3:26 pm	and is filed under Film, News. You can follow any responses to this entry through the RSS 2.0 feed. You can skip to the end and leave a response. Pinging is currently not allowed. « It’s Gonna Be a Bruce Campbell Day At MondoTees! !